Eight unique factions are available for players to enjoy and each boasts a different playstyle. You may even ally two factions together in a single deck to unite their strengths. Lead your faction against a single opponent in a highly strategic joust or take part in a multiplayer melee filled with promises and broken deals. No matter how many players join, your goal remains the same: be the first player to claim fifteen power and win the only game that matters! The game of thrones is played out on the battlefields of Westeros and in whispered conversations at court, in secret alliances and bold ultimatums. 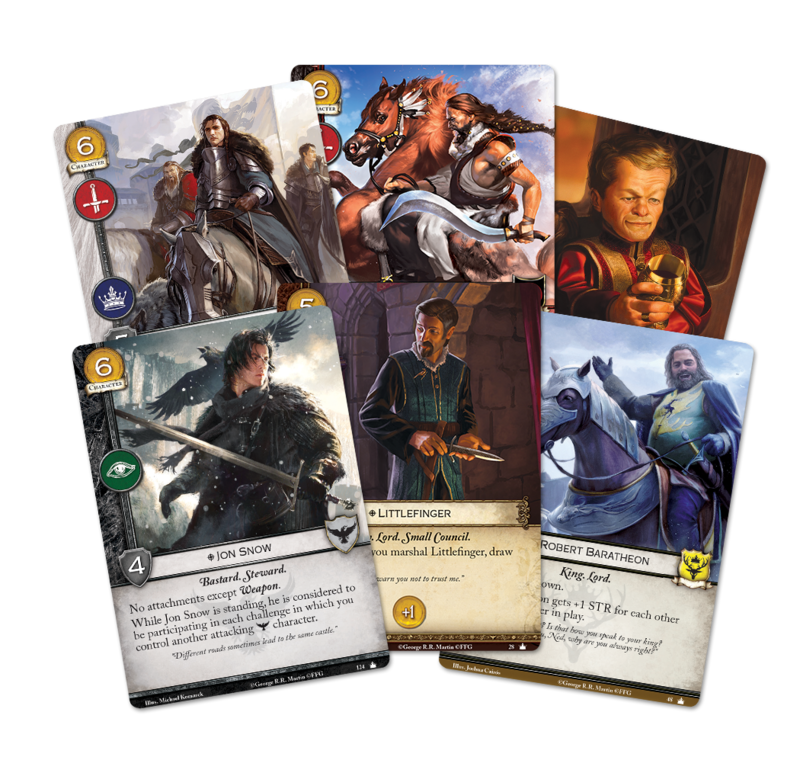 In this LCG, you’ll attack your opponent with three types of challenges: military, intrigue, and power. Each of these challenges has different effects, allowing you to attack your opponents on multiple fronts and punish them in different ways. If you win a military challenge against your opponent, he must choose and kill characters that he controls. Winning intrigue challenges forces your opponent to randomly discard cards from his hand, reducing his options for future turns. Finally, winning a power challenge moves power from your opponent’s faction card to your own, bringing you closer to victory and pushing your enemy further away!